To read the bus schedule, first identify where your stop is in relation to the published timepoints on your route. If your stop is between timepoints, use the given time for the timepoint before your stop for your bus stop’s time. The schedule is in a table format with timepoints listed in the column headers. To determine the time the bus will be at your stop, read the times listed under your time point. Read the schedule left to right to follow the route. Additional help in reading the schedule is available from your friendly driver or the customer service staff at the Metro Bus Transit Center. If you need even more help, call the Metro Bus Mobility Training Center to make an appointment for free Travel Training, 320.529.4497. Where can I get a map of the various routes? Metro Bus System Maps are available at the Metro Bus Transit Center. The maps show an overall view of the entire route system in one convenient area route map. There is a small fee to purchase one of the system maps. Click here to go to the free, online interactive system map. Metro Bus individual route schedules are available free of charge on our website, on all Metro Buses, at the Transit Center, major grocery stores and other outlets. Use the online Trip Planner to view schedule information or download a PDF of a specific route. Wait for the bus at a designated bus stop. Bus stop signs are conveniently located about every two blocks along a route. When waiting at a bus shelter, stand outside as the bus approaches so the driver can see you. Stand back from the curb until the bus comes to a complete stop. Click here for information about shelters and bus stops. Please arrive at the bus stop 5 minutes early to avoid missing the bus. As the bus approaches, check the route destination signs located on the front of the bus near the top and along the side of the bus near the front door. Always confirm your route before boarding. How do I board my bus? Wait until the bus has come to a complete stop and have your pass or money ready before you board the bus. Then, carefully step on board and pay fare. Most Metro Buses are low floor design with no steps to climb to board the bus. If that first step into the bus is difficult, please ask the driver to “kneel the bus.” This will lower the front entrance of the bus. Take a seat if one is available and remain seated while the bus is moving. While choosing your seat, please leave the seats in front for senior citizens or people who have disabilities. How do I transfer to another bus in order to complete my trip? To transfer at the Transit Center: Match the “Arrive Destination” time point on your route schedule with the “Leave Downtown” time point for the transferring route. To transfer mid-route: You can make transfers at any location where two bus routes meet. Step out of the bus and wait for the second bus. Please check schedules to ensure that you will be able to make a transfer connection to complete your trip. You will note that it may be necessary to wait up to ½ hour for a connecting route. Transfers from Metro Bus Fixed Route are not valid on the Metro Bus Dial-a-Ride buses. When you need to make a transfer to complete your trip, request a transfer ticket from the driver when you board the first bus. Transfers are free and valid to use once within two hours. Starting August 21, 2016, transfers will be free and valid for UNLIMITED transfers for two hours. Insert the transfer ticket in the farebox of the route you are transferring to as your form of payment. How do I get off the bus once I reach my destination? About one block before the bus gets to your stop, pull the yellow cord above or between the windows once to signal the driver that you want to get off. Please remain seated until the bus has come to a complete stop. Exit the nearest door and wait until the bus is gone before crossing the street. For your safety NEVER cross in front of the bus. What other information do I need to know about the Metro Bus? Up to two children five and under ride free with a paid fare on any Metro Bus. Lost and Found items can be recovered at the Metro Bus Transit Center. Call 320.251.5411 first to make sure your item has been found. Metro Bus Fixed Route and Dial-a-Ride buses do not operate on New Year’s Day, Memorial Day, Independence Day, Labor Day, Thanksgiving Day, and Christmas Day. Metro Bus service is suspended early in the evening on Christmas Eve. 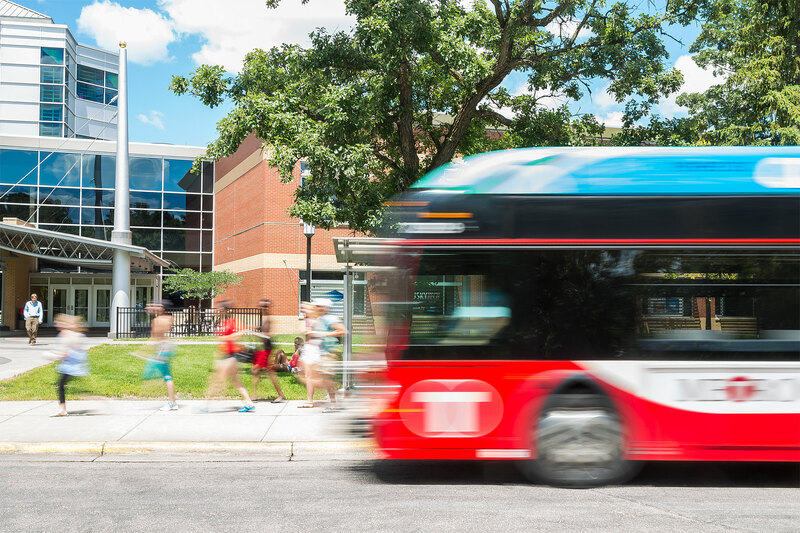 Metro Bus Dial-a-Ride service is available seven days a week to people whose disabilities prevent them from using the Fixed Route – call 320.252.1010 for more information. Take a look at Metro Bus service details, history, ridership information, and other resources.